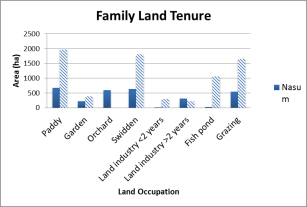 Land tenure in village clusters have been classified in 8 types: paddy, garden, orchard, swidden, land industry (<2 years), land industry (>2 years), fish pond and grazing. 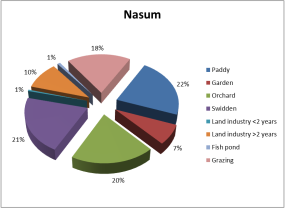 The majority of areas are served for agricultural work and paddy field cover 1,974 ha and 671 ha in Nalat and Naxam respectively. 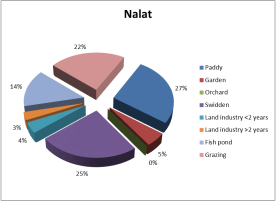 However the land area in Nalat is smaller but the agriculture land is significantly greater than Naxam. This can be concluded that environmental condition such water and soil type are suitable for agricultural work which make people becomes active to involve in agriculture activities.